Enjoy the company of a feathered friend in your garden all year with this Ancient Graffiti Flamed Copper Colored Staked Bird Garden Ornament. Adding this adornment to your garden highlights your love of birds in moments, for a wonderful conversation piece. A 6� long, metal bird figure sports a flamed copper colored finish, and stands as a sentry atop the 30" long, metal stake. The top of this unit bends slightly upward, and an additional bit of metal extends outward, evoking a twig on which the bird is perched. The 3" long, step-in base on the shaft makes installation simple, while raised lines on the bird figure offer striking detail. Varied brown hues on this unit lend it an aged look, mimicking copper, and the all metal construction forms a hardy accent. 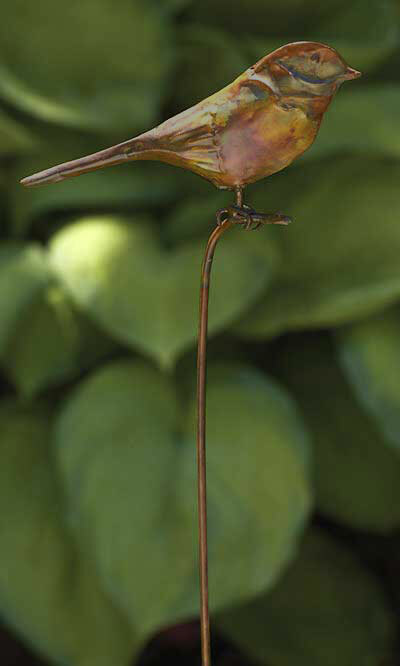 Add a feathered friend into your yard with this Flamed Copper Colored Staked Bird Garden Ornament.